As a participant in the APWG IPC, and a contributing researcher, I was pleased to see Dave Piscitello's APWG Web Vulnerabilities Survey Results and Analysis get some press coverage as it went live in mid-June. Rather than focus on the survey results (you can read those for yourself), I'd like to focus briefly on mitigation and concerns. The Results and Analysis-compiled responses "suggest that web sites would benefit from broader implementation of preventative measures to mitigate known vulnerabilities and also from monitoring for anomalous behavior or suspicious traffic patterns that may indicate previously unseen or zero day attacks." Given the broad scope of CMS platforms, forums, galleries, wikis, shopping carts, and others riding on top of the popular LAMP stack, the absence of such preventative measures and monitoring make for hacker nirvana. Consider the problems shared servers introduce where vulnerabilities in any of the above-mentioned applications preloaded for on demand end-user deployment via cPanel (not to mention cPanel vulnerabilities) can lead to "game over." Clearly there are challenges: resources, level of commitment to security by site operators, and hosting provider scrutiny to mention a few. When pending Black Hat presentations are describing tools sets such as Diggity "that speed the process of finding security vulnerabilities via Google or Bing", or Embedded Web Servers Exposing Organizations To Attack, you know it's Groundhog Day. Great tool set (Diggity), but that we're still unfortunately talking about the ease with which hacker groups are finding "opportunities" is troubling to say the least. When #3 on Kelly Jackson Higgins' list of suggestions to repel attackers states "eliminate SQL injection, XSS, other common website flaws" it's deja vu all over again. While other results lean heavily towards security misconfiguration issues, there are still clear opportunities to improve SDL/SDLC practices. As the survey report indicates, "This article barely scratches the surface of the intelligence the APWG IPC has accumulated from the Web Vulnerability Survey. A complete analysis of the survey results—with specific recommendations, remedies, and practices." I'm in the midst of research focusing on the scanning and misconfiguration elements of Internet Background Radiation (IBR) using a variety of Web logs. This research still points back to the above mentioned problem space and suggestions, but will drive deeper into attacker and victim trends and traits. This work, coupled with earlier web application security research will feed the analysis paper pending publication by the APWG IPC. My hope is to also present the IBR work at an upcoming security conference along with a paper or article. A quick note to any Seattle-area readers. This is an RSVP only event, please visit the ISSA Puget Sound website for all the details. Mark will be offering both his recent books, Zero Day: A Novel and Windows Sysinternals Administrator's Reference for sale and will be signing them as well. If you're in the area, please RSVP and attend this outstanding event and opportunity. In July's toolsmith I admit to the fact that I’ve often focused on run-time web application security assessment tools and paid absolutely no attention to static analysis tools. 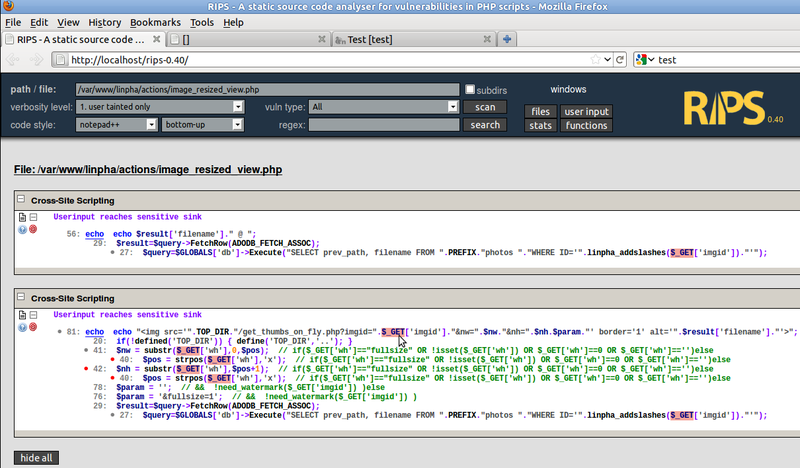 For those of you in a similar boat, RIPS is a static source code analyzer for vulnerabilities in PHP. 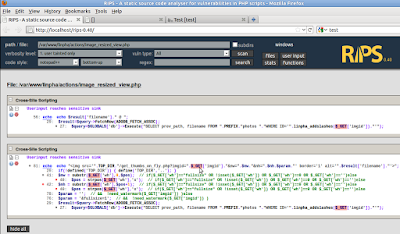 RIPS is written by Johannes Dahse who uses it when he audits PHP code, often during Capture The Flag contests. To test RIPS in all it's glory, I compared its functionality to known finding from a vulnerability disclosure and advisory I posted for Linpha 1.3.4 in March 2009. Linpha 1.3.4 is a photo/image gallery (no longer supported or maintained) which exhibited cross-site request forgery (CSRF) and cross-site scripting (XSS) vulnerabilities during runtime analysis. /var/www/linpha/actions/image_resized_view.php in the RIPS UI and clicked scan. The results were immediate and clearly identified in source code the same vulnerability I’d discovered at run-time, as seen in Figure 1. Note that RIPS tags the imgid parameter as vulnerable right out of the gate. RIPS is becoming more and more feature-rich with each new release; while it's a work in progress, it’s already quite effective and Johannes is actively developing it. You'll enjoy code viewing and exploit creation functionality but one of my favorite new features is graphical representations of scanned files and includes with representation of “how files are connected to each other, what files accept sources (userinput) and what files have sensitive sinks or vulnerabilities” as seen in Figure 2. Check out the RIPS article here, and download RIPS and Johannes' white paper here.